IndoSoul : Music Album by Karthick Iyer Live! Which is the second largest religion in the world? Music! While Humanity being the first. These days we are a bit short on the first one, but definitely not on the second. 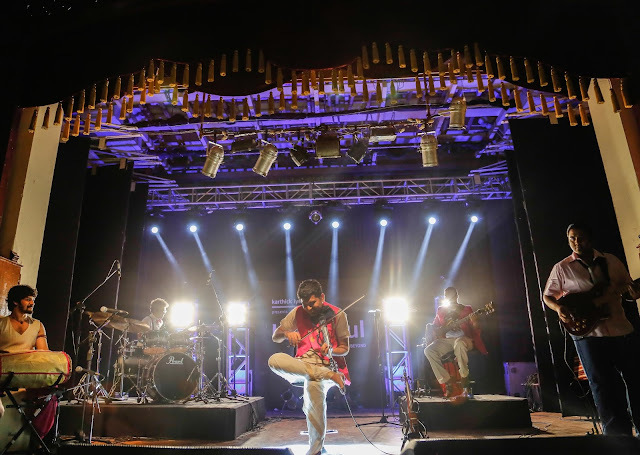 Though the mainstream Bollywood music hasn't been able to keep up with it's pace, but the unconventional and independent artists have been doing phenomenally well and have shown signs of improvement at the global juncture. In this blog post I am writing about an album titled IndoSoul by Karthick Iyer Live, the album is available online can be found on SoundCloud and Karthick Iyer's website. The album has a collection of 6 songs which are all distinct from each other. Out of these six, only one song has lyrics while the others are all instrumental. You can listen to all the songs embedded below. My personal favorite from IndoSoul has been Boundless. If you have already heard the song you might be wondering why, it's because the instrumental beats tell a story. There is drama in the music and a constant beat that connects with you. Do you agree with me on this or have a different viewpoint? Let me know in the comments below. IndoSoul, as the name suggests, is a great attempt at soulful instrumental music. It sounds like a collaboration between the Indian and the Indian-ness within. I would love to be proved wrong in the next statement, but somewhere I feel that not everyone would want to hear it as it's not what currently is in trend but those who love and understand music will definitely appreciate the efforts. Great post Kaushal. Am bookmarking this article so that I can return to listen to the songs. Thank you Vishal, hope you liked the songs! Wow. What a post, all my favorite music albums in it. Thank you for making a post for us. as compared to the others. And most definitely it has changed the way you listen to your online music..